What would you be willing to risk for a lifetime of fortune? Emmett Atwater isn't just leaving Detroit; he's leaving Earth. Why the Babel Corporation recruited him is a mystery, but the number of zeroes on their contract has him boarding their lightship and hoping to return to Earth with enough money to take care of his family. Forever. Before long, Emmett discovers that he is one of ten recruits, all of whom have troubled pasts and are a long way from home. 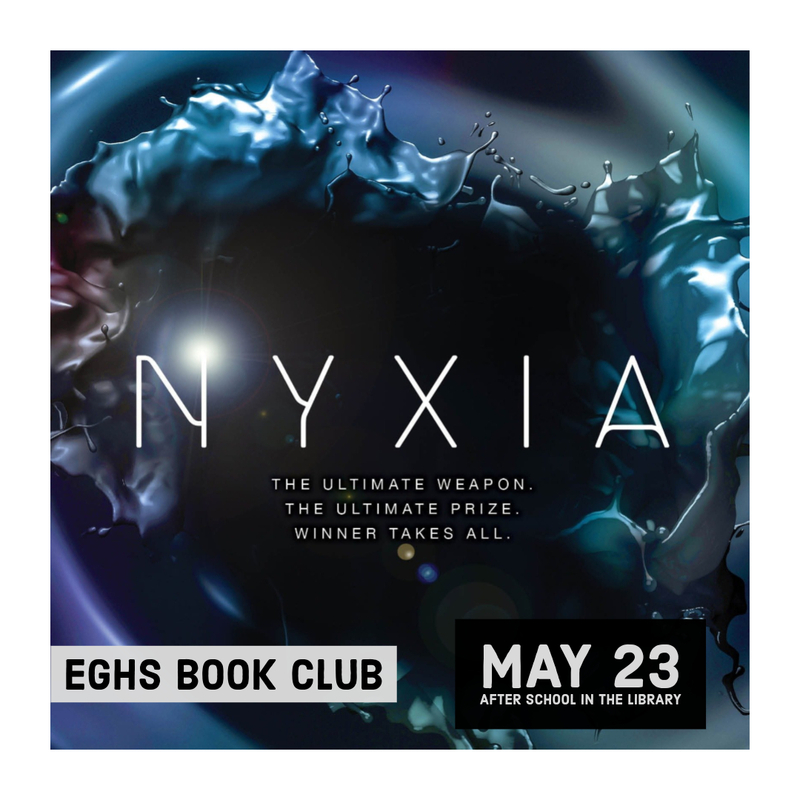 Now each recruit must earn the right to travel down to the planet of Eden--a planet that Babel has kept hidden--where they will mine a substance called Nyxia that has quietly become the most valuable material in the universe. But Babel's ship is full of secrets. And Emmett will face the ultimate choice: win the fortune at any cost, or find a way to fight that won't forever compromise what it means to be human. Emmett Atwater thought Babel's game sounded easy. Get points. Get paid. Go home. But it didn't take long for him to learn that Babel's competition was full of broken promises, none darker or more damaging than the last one. Now Emmett and the rest of the Genesis spaceship survivors must rally and forge their own path through a new world. Their mission from Babel is simple: extract nyxia, the most valuable material in the universe, and play nice with the indigenous Adamite population. But Emmett and the others quickly realize they are caught between two powerful forces-Babel and the Adamites-with clashing desires. Will the Genesis team make it out alive before it's too late? Rufus Holt has one night to prove his half-sister, April, innocent of murdering her boyfriend at a wild party--the very night his ex-boyfriend, Sebastian, shows up wanting to talk. When a scholarship girl and a wealthy classmate become friends, their bond is tested when a handsome young teacher separately influences the girls in order to further his less-than-admirable interests. While on spring break in Aruba, a young girl is accused of her best friend's death and must stand trial for murder in a foreign country. Ten teens head to a house party at a remote island mansion off the Washington coast . . . only to picked off by a killer one by one. Compulsive liar Micah promises to tell the truth after revealing that her boyfriend has been murdered. As a town prepares for the anniversary of the deaths of five cheerleaders who were killed in three separate, horrific accidents, two teens uncover long-buried truths about what really happened years ago. When friends Rob, Liam, Mia, and Galen gather for a weekend of fun deep in the forest, one is hiding a lie and not everyone will live to find out which one it is. When Long Island teens Miri, Soleil, Penny, and Jonah befriend a bestselling YA novelist, they find their deepest, darkest secrets in the pages of her next novel, with devastating consequences. Seventeen-year-old mathematical genius Peter Blankman battles his lifelong panic attacks as he tries to find his missing twin sister, Bel, and those who nearly assassinated his mother, a famous scientist. 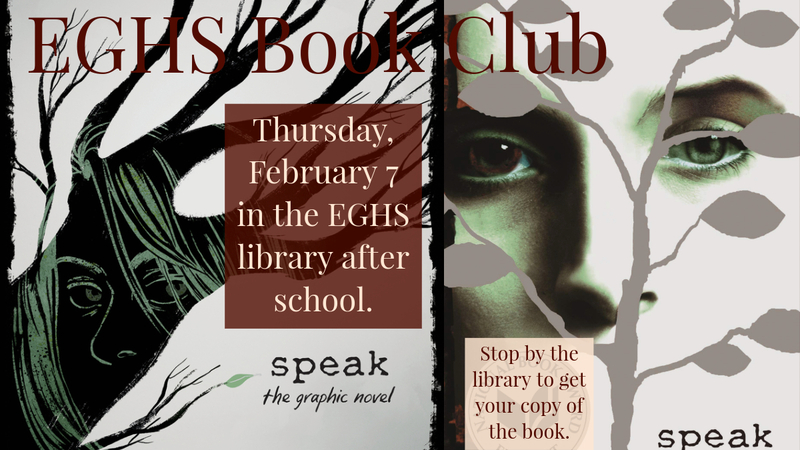 The winter book club meeting took place Thursday, February 7 after school in the library. The reading selection was "Speak", written by Laurie Halse Anderson. Participants could read either the text or graphic novel version. Participating students enjoyed snacks and took part in a lively discussion. Readers who enjoyed reading Speak, will want to read the following titles. When thirteen-year-old Tracy, whose mother died when she was three years old, is raped and beaten on the last day of school, all her feelings of security disappear and she does not know how to cope with the fear and dread that engulf her. Recovering from the recent suicide of her ex-boyfriend, senior class president Keisha Montgomery finds herself attracted to a dangerous, older man. After seeing a girl raped and becoming obsessed with her, sixteen-year-old Thulani finds motivation to move beyond his interest in his birds and his grief over his mother's death. Comic book artist Daniel Stone, a stay-at-home dad with a fourteen-year-old daughter Trixie, and an unfaithful wife, turns a blind eye to Trixie's first broken heart and wife Laura's affair, but the feelings of rage he has buried for years come to the surface when Trixie is raped at a party and accuses her former boyfriend. When seventeen-year-old Alex starts dating Cole, a new boy at her high school, her two closest friends increasingly mistrust him as the relationship grows more serious. Leslie's life seems to settle from chaos to wonderful when Jason, the new guy in school, asks her out, but things quickly spin out of control when she finds out that Jason is not as nice as she thought and she must find a way to break out of the relationship. 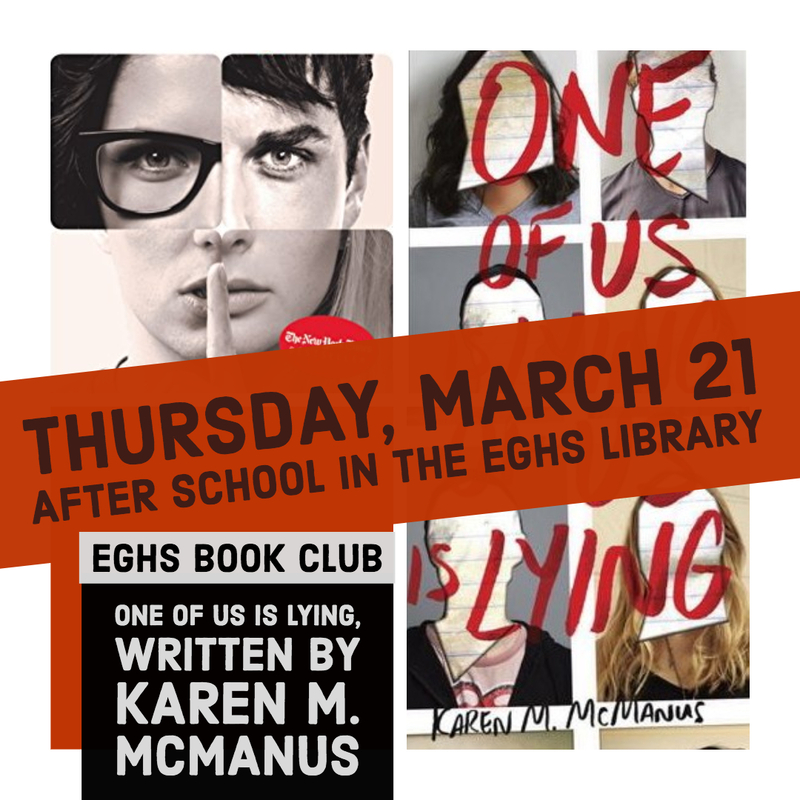 Email Student Book Club leaders Caroline Reilly or Jill Valente. Book Club Meeting - Thursday, October 25, 2018. The first book club meeting was held Thursday, October 25 after school in the library. We enjoyed snacks and briefly discussed the books "Go Set a Watchman" and "Grendel’s Guide to Love and War". Twenty-six-year-old Jean Louise Finch-"Scout"-returns home from New York City to visit her aging father, Atticus. Set against the backdrop of the civil rights tensions and political turmoil that were transforming the South, Jean Louise's homecoming turns bittersweet when she learns disturbing truths about her close-knit family, the town, and the people dearest to her. Memories from her childhood flood back, and her values and assumptions are thrown into doubt. Tom Grendel lives a quiet life--writing in his notebooks, mowing lawns for his elderly neighbors, and pining for Willow, a girl next door who rejects the "manic-pixie-dream" label. But when Willow's brother, Rex (the bro-iest bro ever to don a jockstrap), starts throwing wild parties, the idyllic senior citizens' community where they live is transformed into a war zone. Tom is rightfully pissed--his dad is an Iraq vet, and the noise from the parties triggers his PTSD--so he comes up with a plan to end the parties for good. One teenager in a skirt. One teenager with a lighter. One moment that changes both of their lives forever. Journalist and novelist Dashka Slater (a regular Mother Jones contributor) spent three years investigating that fire and its aftermath, first for the New York Times Magazine, and then for her own young-adult book, The 57 Bus. This is the article that predated the book. A story about a teen who wakes up every morning in a different body, living a different life. Every day a different body. Every day a different life. Every day in love with the same girl. There's never any warning about where it will be or who it will be. No Choirboy takes readers inside America's prisons, and allows inmates sentenced to death as teenagers to speak for themselves. In their own voices--raw and uncensored--they talk about their lives in prison, and share their thoughts and feelings about how they ended up there. Second Book Club Meeting - Thursday, December 6, 2018. The second book club meeting took place Thursday, December 6 after school in the library. 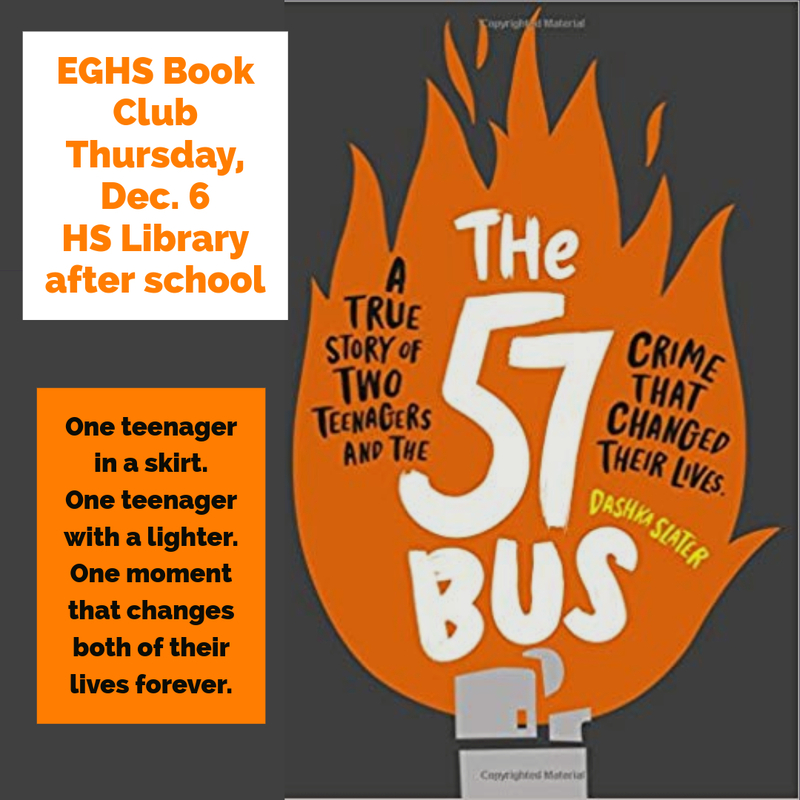 Students read "The 57 Bus", written by Dashka Slater.